Tom, a successful businessman in Chicago has gone to Northern Michigan on a hunt. His childhood friend has gone missing and Tom is determined to find him. The search for the lost man begins as a mystery and evolves into an act of redemption. Tom will stop at nothing to find his friend and discover the truth behind his disappearance. 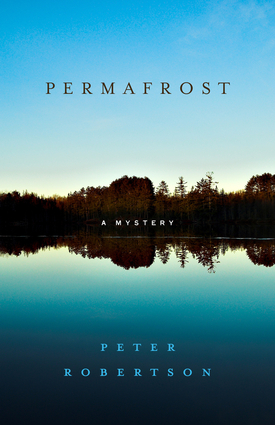 "Peter Robertson's Permafrost is to picturesque northern Michigan what Harlan Coben's novels are to his beloved New Jersey. In fact, Coben fans will find kindred spirits—and page-turning suspense—in this smashing psychological thriller about a man troubled by secrets and a past he is trying to understand. Robertson's world is granular, vivid, and complex—his characters, filled with regret and menace, search for redemption in an entirely genuine and moving way. Robertson's lyrical prose hooked me by the third sentence—I turned the pages right into dawn where the sun was rising on the damage, with the hint of salvation—just maybe. The welcome beginning of a superbly smart and addictive series." —Doug Stanton, author, In Harm's Way and Horse Soldiers. Peter Robertson was born and raised in Edinburgh, Scotland. He has been a book reviewer for daily papers and magazines, stay-at-home dad, soccer coach, university student, and elementary and middle school teacher. He is the author of Colorblind and Mission. He lives in Chicago.